Located in Huatulco, Hotel Cruzanta is by the sea, within a 10-minute drive of Marina Chahue and Chahue Beach. Featured amenities include a 24-hour front desk and luggage storage. Free self parking is available onsite. 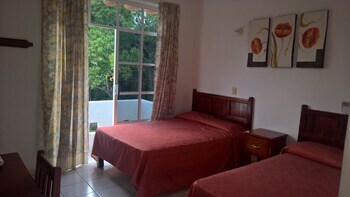 Located in Playa del Carmen (Playacar), Wayak Apartment is minutes from Playacar Golf Club and Mahi Golf Course. With a stay at Casa Cinco Patios in San Miguel de Allende, you'll be a 4-minute walk from El Mirador Viewpoint and 5 minutes by foot from La Esquina Mexican Folk Toy Museum. A stay at Condominios Orca C3 places you in the heart of Progreso, a 1-minute drive from Progreso Beach and 6 minutes from Progreso Lighthouse. Free self parking is available onsite.